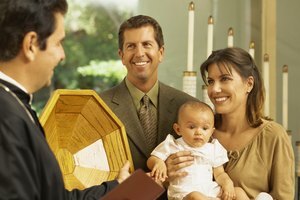 Give a gift to your child's godparents on the occasion of his baptism. Whether you choose close friends or family members to be your child’s godparents, giving a special godparent gift can show your gratitude on baptism day. 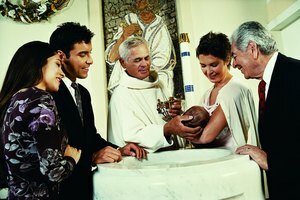 In the Roman Catholic tradition, like other orthodox religions, godparents affirm their faith during the baptism ceremony and commit to supporting and raising the child in case of the untimely death of the child’s parents. Ideally, the godparents remain an important part of the child’s life and participate in his significant milestone events. Consider giving your child’s godparents a gift for their home that they can treasure and admire for years to come. Religious items such as a crucifix or rosary to hang on the wall are sentimental and decorative. A photograph of the godparents with the child on baptism day makes a personal and meaningful gift. You can place it in a silver picture frame engraved with the date or paint a frame by hand to match the family’s decor. 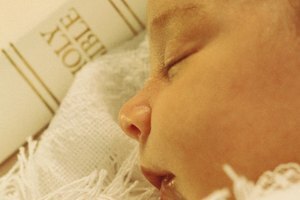 For the couch or love seat, think about giving a soft blanket or pillow with the baptism date sewn in the corner alongside the phrase, “World’s best godparents” or a verse from the Bible. Engraved cups and keepsake boxes are charming additions to side tables and mantles, and can hold mementos from the baptism day. If your child’s godparents are foodies or love gourmet items, think about getting them a kitchen-related item as a gift for participating in the baptism. For the avid coffee or tea drinker, design a personalized mug that the godparents can use each morning. Other tasty items that can be enjoyed immediately include bottles of wine, specialty cheeses or artisan chocolates. For some godparents, fashion and jewelry make a better gift than home decor. Mark your child’s special baptism by composing a card for the godparents and attaching a decorative lapel pin to the card. Some people might like small mementos such as a crucifix pendant, bracelet, watch, or engraved key chain to commemorate the occasion. Gifts for nature lovers or those who enjoy working in the garden are another way to recognize the special relationship that the godparents have with your family, and especially your child. Design a stepping stone for the garden with the word “godparents” on it, along with the baptism date, which will serve as a reminder of their bonding relationship. Other commemorative garden pieces include statues of patron saints, angels, plants or birdbaths. Dyke, Kimberly. "Godparent Gifts for a Catholic Baptism." Synonym, https://classroom.synonym.com/godparent-gifts-catholic-baptism-6824.html. Accessed 19 April 2019.